A hillside village with views that extend all the way to the Caribbean Sea. A historic park surrounded by a beautiful church, the smell of cooking street food, and laughing children. Luxury shops mixed with up-and-coming designers’ boutiques. A renovated hotel that was modernized without losing its charm. Restaurants where music and cocktails spill onto terraces late into the night. This is what you were hoping to find in Haiti by now. It’s hard to believe that Haiti was once the “it” destination. But it was. Briefly. Movie stars and musicians flocked to the western half of Hispaniola in the 1950s. Then Papa Doc, a brutal despot, was elected president. Political instability and extreme poverty followed. Devastating hurricanes didn’t help either. Things were supposed to change with the 2017 election of Jovenel Moïse. But protests and street demonstrations are intensifying once again. Haiti’s next tourism boom is on hold. So your Haitian travel plans have to be put off. Again. 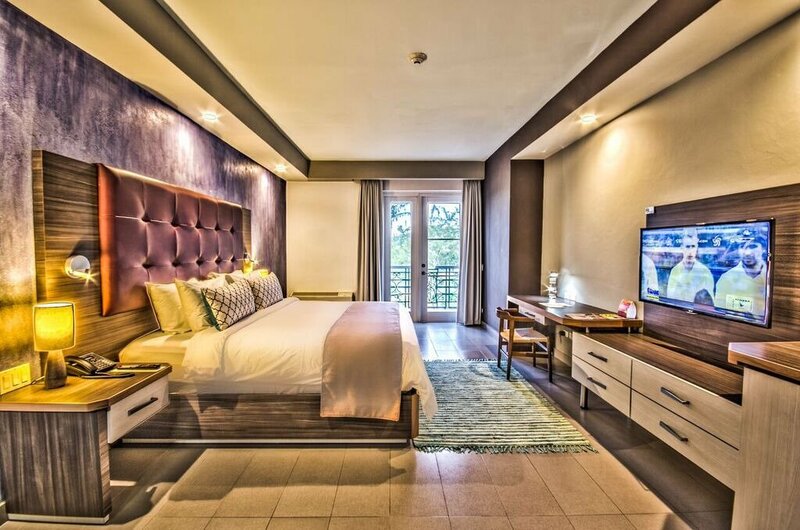 You won’t be able to visit Pétion-Ville quite yet. 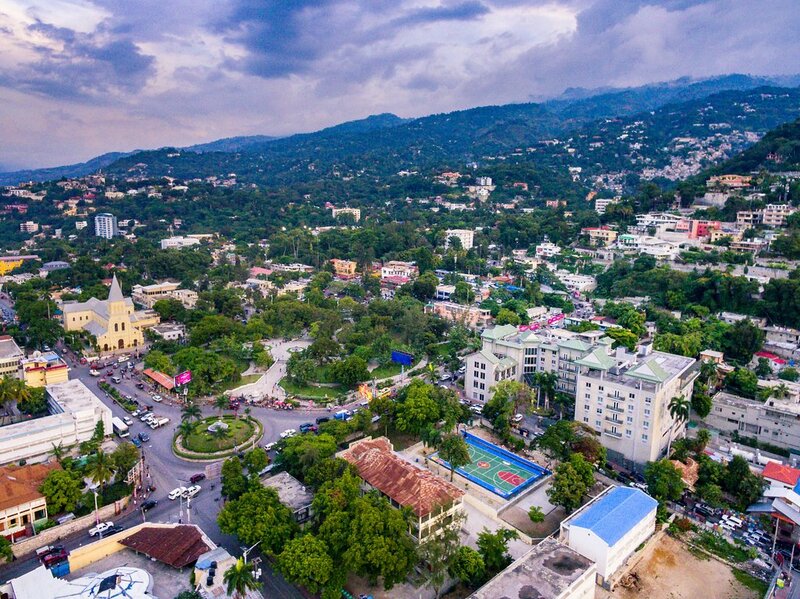 The hillside suburb of Port-au-Prince, named after the country’s first president, is one of the city’s wealthiest and most stable neighborhoods. It’s home to Place St. Pierre, St. Peter’s Church, and upscale stores. It’s also where the Kinam Hotel is located. The Kinam Hotel first opened in 1900. The gingerbread-house hotel—a Haitian style known for its high ceilings, turret roofs, and wrap-around verandas—had nine rooms. The family-owned hotel was renovated over the years, but true modernization didn’t come until 2014. That’s when a new wing and 85 more rooms were added. Haitian artwork and iPod docks were included, as well. The rooms weren’t the only additions to the hotel. A three-story, granite wall fountain was added to the lobby. Le Rond-Point, a sleek restaurant, opened on the third floor. It offers French-Haitian cuisine and views of Place St. Pierre from its patio. A second restaurant, Kinam Terrace, overlooks the courtyard pool. This is where you can sample traditional Haitian food, like djon-djon. The mushroom dish is usually served with rice, but it’s upgraded with pasta here. A cocktail bar (rum punches), a wine bar (French varietals), and a coffee shop (Haitian-grown coffee and chocolates) are available, too. Now you’re just torturing yourself. You know where you want to go, where you want to stay, and even where you want to eat during your first trip to Haiti. So you’ll continue to wait and hope that things begin to turn around again. Tourism could greatly help the troubled country get back on the right path.